Rev. William E. Coleman, Jr. 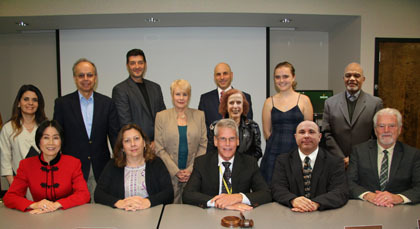 Seated, from left: Dr. Walt MacDonald (treasurer), Mark Matzen (chair), Dr. Jianping Wang (secretary and MCCC president), and Kevin Drennan (vice chair); Standing, from left: Perry Lattiboudere (college counsel), Angela Delli Santi, Anthony Inverso, Rev. William E. Coleman Jr., Pamela Hirsch, David Fried, and Dr. Lawrence A. Nespoli. Not pictured: Yasmin E. Hernandez-Manno and Carly Layton (alumni trustee). All meetings are scheduled to begin at 6:30 p.m. Unless otherwise announced, meetings at the West Windsor Campus (WWC) are held in the Board Room (AD 107) in the Administration Building. Meetings at the James Kerney Campus (JKC) are held in Kerney Hall.